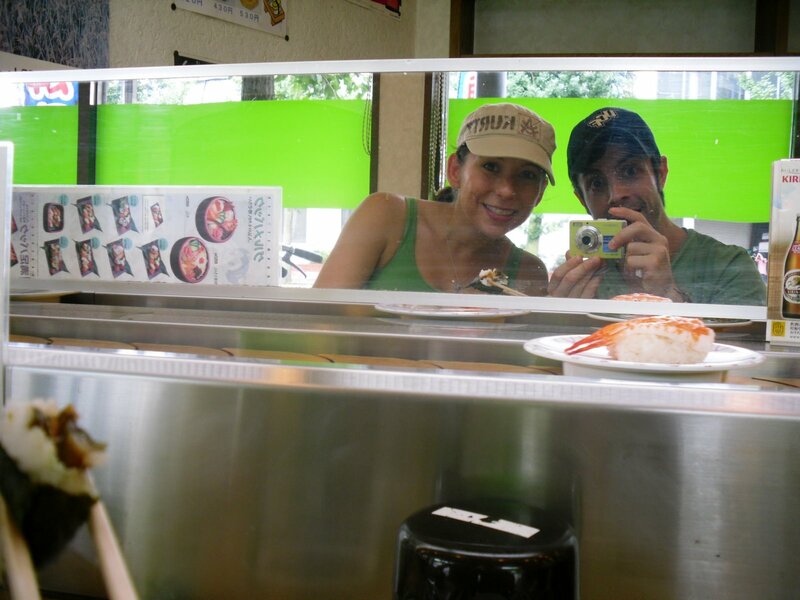 Temples, Sushi and Geisha…it’s all we really wanted to experience in Japan. So Saturday morning we ventured out on our own two feet to accomplish a good hike around Kyoto with my map reading skills and Adam in charge of the camera and carrying the bag. Our first stop was the HUGE Nishi Hongwanji temple next to our hotel. One thing to know, it began to downpour the second we left the hotel, but we were not going to let that stop us! 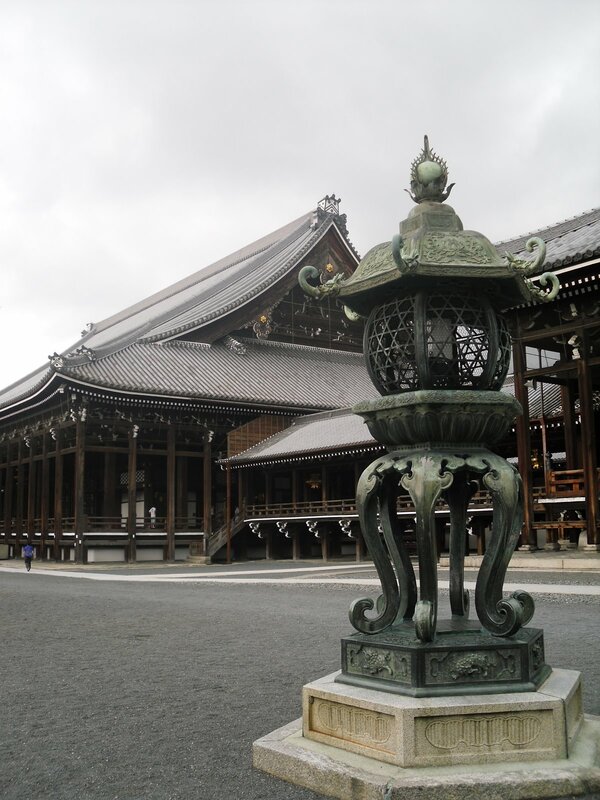 The Nishi Hongwanji is the largest buddhist temple in the world. It is actually the headquarters for Shin Buddhism. 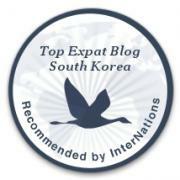 More that 10500 temples and churches throughout the world call it their home. The temple was established 700 years ago by Toyotomi Hideyoshi in honor of Shinran Shonin, the founder of the Shin Buddhist Traditions. The whole compound is considered a National Treasure and Important Cultural Asset. Monks live and train on their campus. 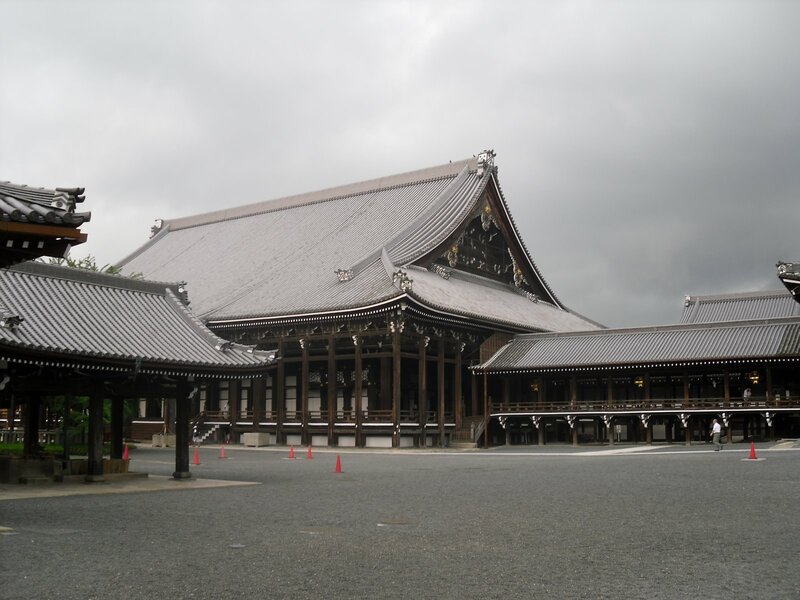 At one point, Toyotomi got in a huge disagreement with one of his councilmen and he left the temple and build a similar one two blocks down the road, but not nearly as large. The doors to the temple were huge!! 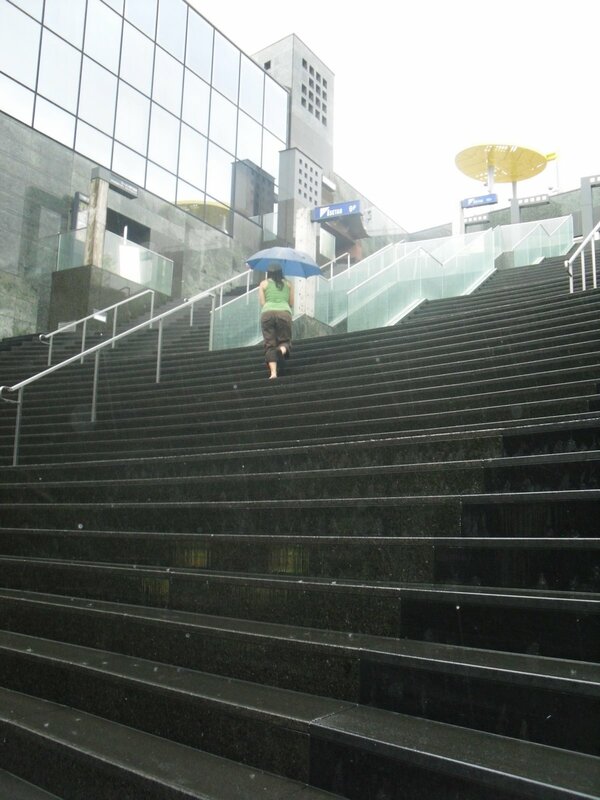 walkway that you can pass through the whole upper station. There is an observation deck surrounded by glass where you can see the whole city. It was an amazing structure which would do great in the states! 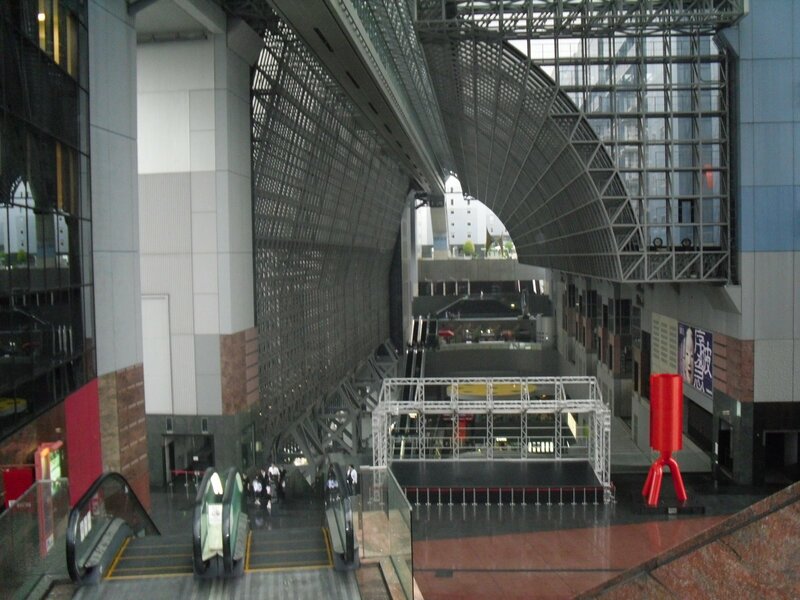 You could spend a whole day just roaming around the station, stay in the hotel connected and grab a bite to eat on every floor. After the a bite we headed south west toward the 5 story pagoda called the Toji Temple. It was rebuilt in 1644 and stands 180 ft. tall. 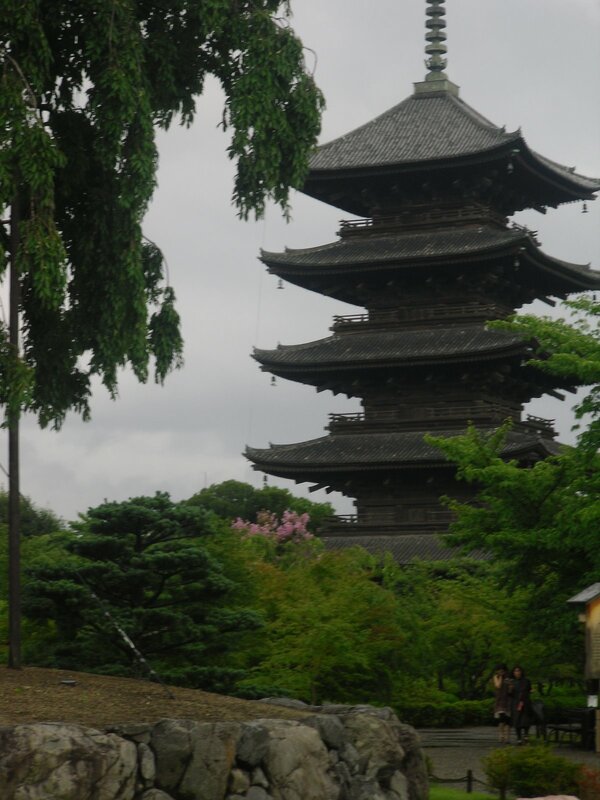 it is Japans tallest pagoda. 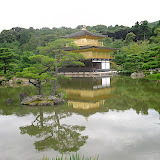 The temple was established in 796 and reflects Buddhist traditions from China, India and Japan. After that we headed to the Tofukuji Temple and Rock Garden to the south east of Kyoto. 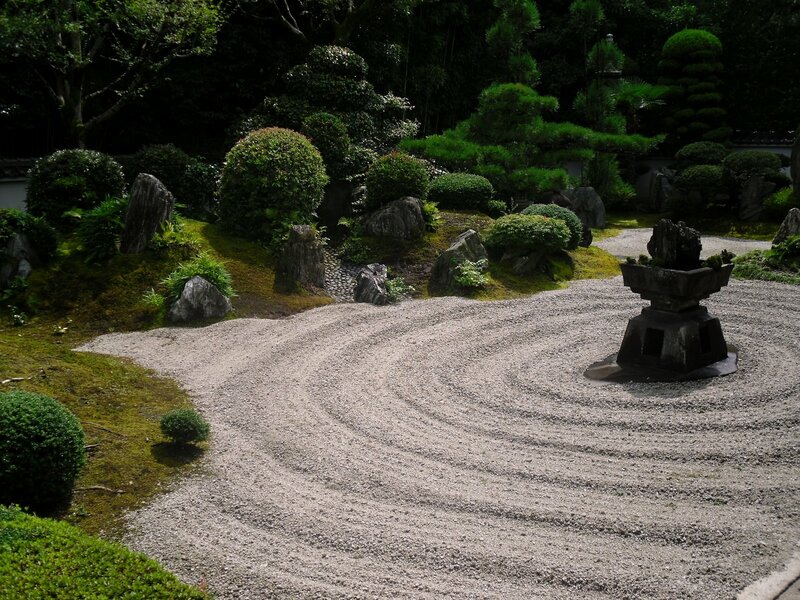 The temple was set up in 1390 by priest Kiyo-hoshu, The rock garden symbolizes the holy mountain where Buddha lives and the circles in the sand represent a waterfall and a mini hill. 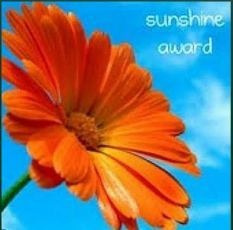 The garden it says, expresses the true aspect of the great universe. We headed uptown (thats what they call it when you head North toward the mountain. There is a river that runs along the east side of the city which separates “old” Kyoto from “new” Kyoto. We headed up river toward Gion which we were told if we were lucky we may spot a geisha, which are really called Meiko and Geiko…Ill explain later. On our way up, we got a bit off the main road and walked through a residential area with amazing old architecture and then found a sushi bar where we splurged and for $10.00 total had some great snacks. Further up the street we found a Tea House run by this very tiny old couple. They were both hunched over and shuffled around making us tea and coffee from their gas oven. They were super adorable. We felt like it was our calling to sit there for a good 20 minutes and keep them company. 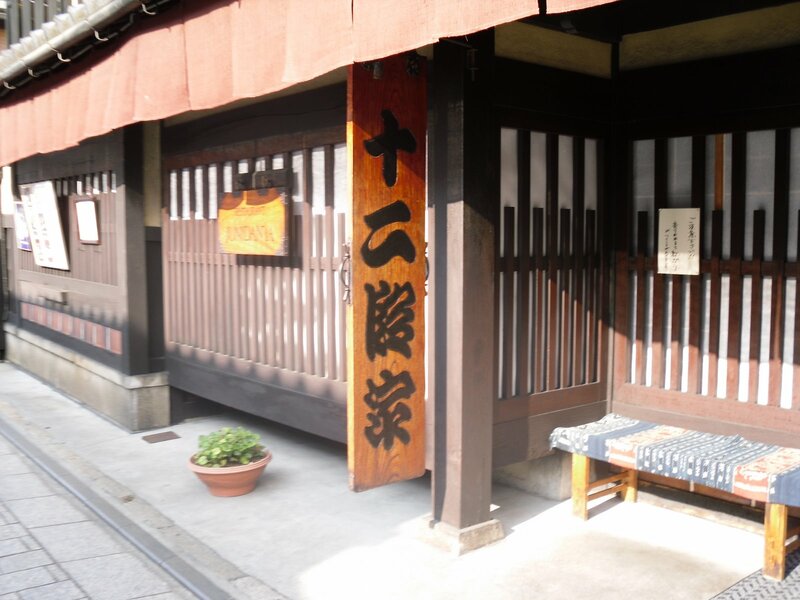 Once we found Gion, it was like a movie town. 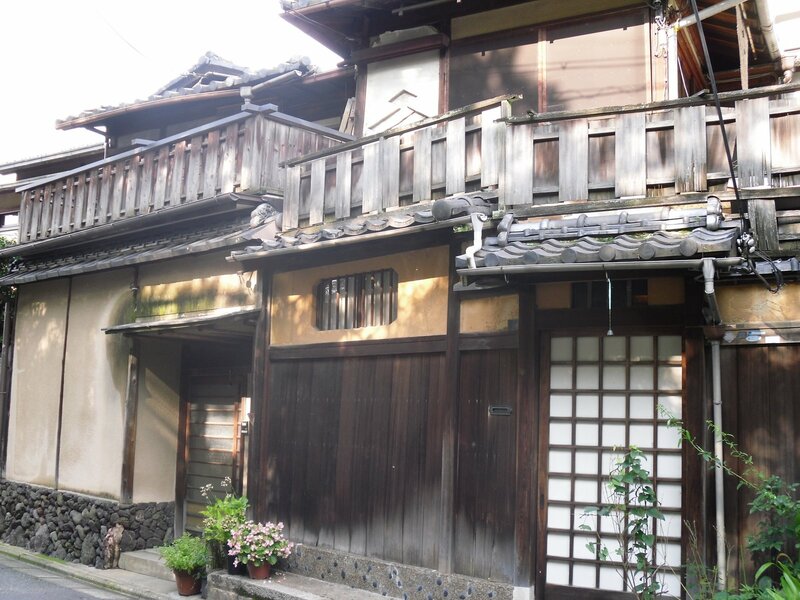 The strips of old homes was extremely clean and so beautifully built. On the block just before the strip we found many “Love Hotels” We were told that many Japanese people can’t ever afford a tea house with a Geiko because they can run up to 500 dollars. We were also told that 80% of Meikos in training to be Geiko’s drop out of “Geisha” training. They are not paid anything and find it very hard to afford all of their expensive Kimono. Also, Meikos begin training around 13 and stay in training until about 20. They wear bright colored Kimonos with much more vibrant makeup and hairdos. They are seen as cute and get a lot of attention. Geiko’s, the older “geisha” wear dark kimonos and are seen as serious unsmiling symbols of Japan. 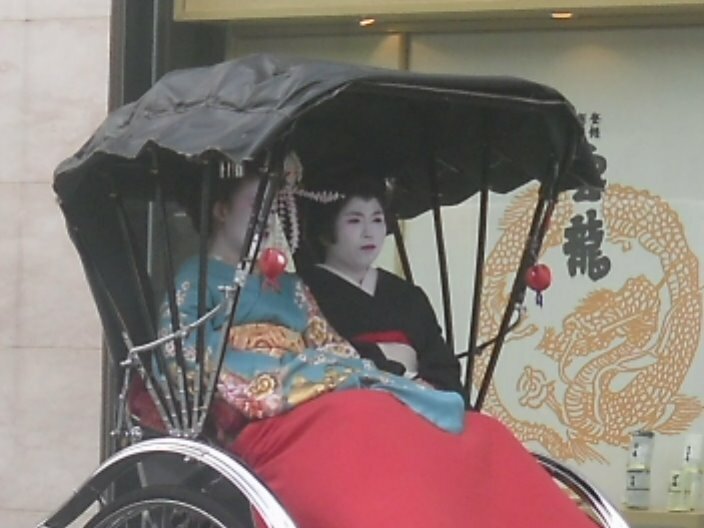 As we were heading out of Gion, amongst the traffic, taxis, busses and hustle of the city, was a rickshaw with both a Meiko and Geiko inside. Adam snapped a shot and we were content. We headed back to the train station to head to Osaka for our last night in Japan.